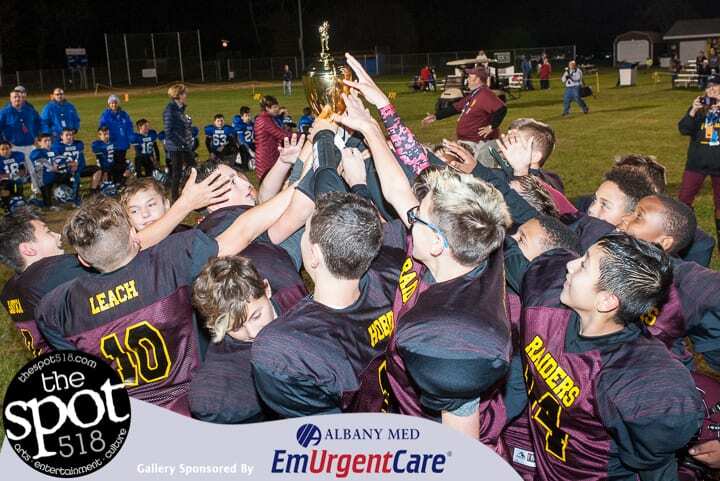 COLONIE – The Raiders from South Colonie won the DARE Cup by beating cross town rival North Colonie 19-7 on Saturday, Sept. 30. Sergio Lazaro scored twice for South Colonie on a 55-yard run and then a 40-yard run. His teammate, Geno Savoca, scored on a 35-yard run to round out the scoring for Colonie. The DARE Cup is a rivalry that started years ago but has been dormant for the last few. It was revived this year by the coaching staff of both squads. Supervisor Paula Mahan and Town Board member Linda Murphy were on hand to give the coveted cup to the South Colonie coach Andy Faragon, the coaching staff and, of course, the players.